Macaroni and cheese. Image courtesy of Wikimedia Commons. Mac and cheese is a well-loved, popular, time-tested dish, one that’s woven into the histories and cultures and memories of people around the world. In America it’s an essential soul food dish. In Canada, Kraft Dinner – mac and cheese with pieces of hot dogs and a squirt of ketchup – is a comfort food staple. Western Europeans claim macaroni and cheese too, tracing its origins to the Swiss Alps, where Älplermagronen was made by French-speaking Swiss people, who believed it was the ideal snack for shepherds. Macaroni and cheese appears in Anglo-American cookbooks as early as the fourteenth century – its antecedents include a sort of lasagna-like food called “Macrows” in the 1390 Forme of Cury – and by the long eighteenth century, the cheesy noodles were an established dish, garnering frequent mentions in both print and manuscript. Marissa Nicosia and Alyssa Connell chose an eighteenth-century “Maccarony Cheese” for their very first post on Cooking in the Archive, and it was a hit, helping to launch their incredibly successful blog and garnering a host of re-posts, comments, and suggestions. In most Anglo-American recipes for mac and cheese, eighteenth-century authors called for the noodles to be boiled until tender and then mixed with ingredients like butter, eggs, and cheese. The noodles were then either baked or put under a salamander – which in the period was a piece of iron that was heated and passed over a dish – that was supposed to give it a nice brown crust. It’s a wonderful dish to suggest to folks who like to re-create early modern recipes, because most early examples of macaroni and cheese contain familiar, easy-to-obtain ingredients and clear, straightforward instructions. But there are always exceptions to the rule. Recently I found a recipe for macaroni and cheese in an eighteenth-century letter, and the account was confusing, if not downright disgusting. 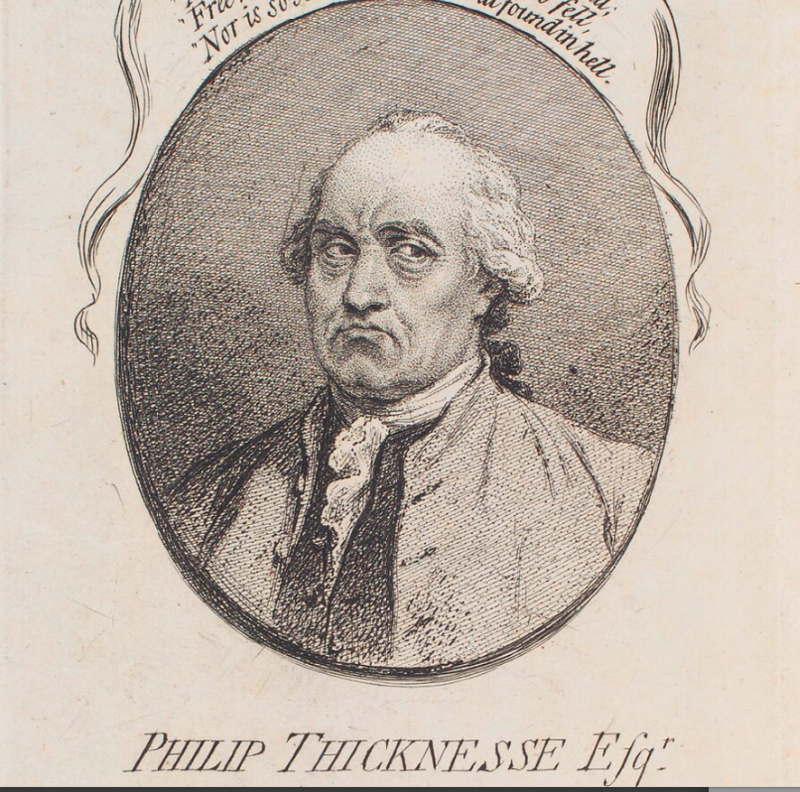 Philip Thicknesse (1719-1792), an eighteenth-century artist, traveler, and writer, included a recipe for mac and cheese in a letter written to a man named John Cook. Thicknesse spent a lot of time in France and took pride in his knowledge of French cuisine. 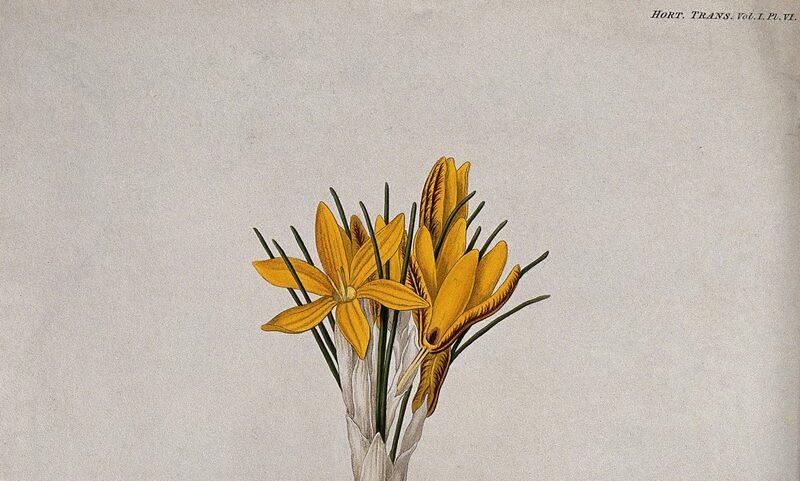 He wrote to his friend Cook on January 14, 1770 that he had recently “recv’d a very small present from France,” which included foods such as “Olives, a few Anchovies, [and] a pint of Vinegar.” But the crowning glory of this gourmet stash was “some Maccerone.” Thicknesse shared a portion of his dried French noodles with John Cook, bragging that macaroni and cheese was “no bad dish” and including instructions for preparing the food. And this is where things seemed to go wrong. A pleasant and confident Thicknesse. Nathaniel Hone, Philip Thicknesse, enamel on copper, 1757, NPG 4192. 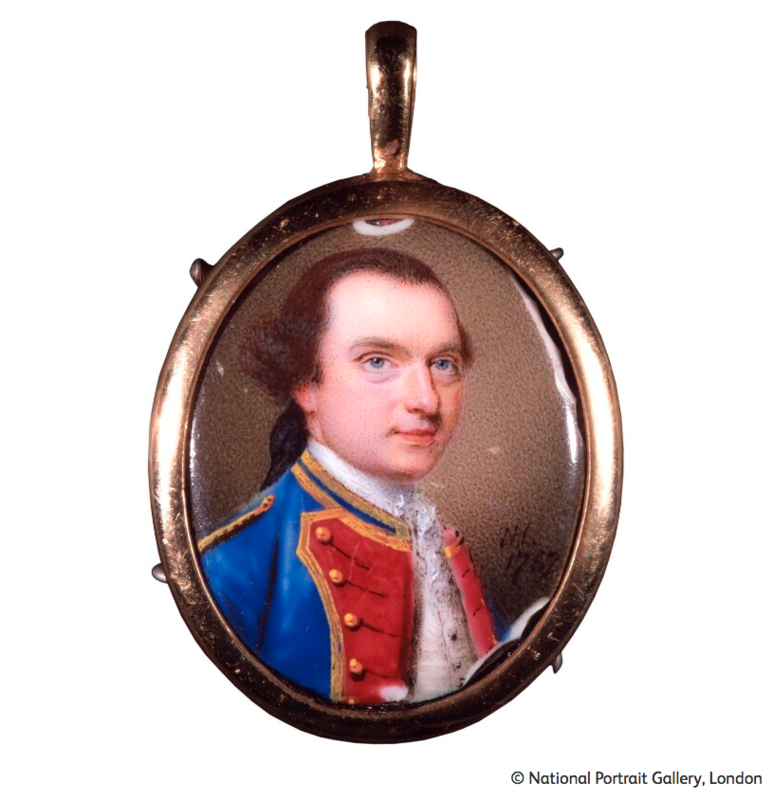 Image courtesy of the National Portrait Gallery, London. Thicknesse told Cook to take the packet of noodles and “boil it in water til it is quite tender, on[e] hour and a half at least, then the remaining water is poured off, and some butter and scraped cheese is put to it til both are well melted & dis[s]olved.” [My emphasis.] When I read this in the Huntington’s reading room I had to rub my eyes and take another look. Boiling modern-day macaroni noodles for an hour and a half (at least!) would render them into an unappetizing slush, so far beyond al dente that they’d surely constitute a crime against pasta. Was Thickness a bad cook? Why was his advice so terrible? At first I thought that this was a classic example of mistranslation in the period: the introduction of new foods into Western European diets via the so-called “Consumer Revolution” wasn’t a straightforward or guaranteed process, and British experiments with foods sourced from the Atlantic, Pacific, and Mediterranean worlds could go wrong as frequently as they went right. Thicknesse didn’t understand how pasta was supposed to be cooked, and as a result he offered bad culinary advice to his friend. 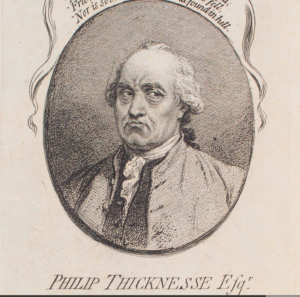 Another contemporary depiction of Thicknesse, perhaps grumpy about overcooked pasta. James Gillray, “Philip Thicknesse,” etching published by James Ridgway (1790), NPG D12410. Image courtesy of the National Portrait Gallery, London. But the more I thought about Thicknesse and his overcooked macaroni, the more I began to wonder if there wasn’t an entirely different process of mistranslation at work: one that was my own, rather than my historical subject’s. What did Thicknesse’s pasta look like? How long would it have taken to cook? It turns out that, in the long eighteenth century, Western European people ate two very different kinds of pasta: soft noodles, made out of a paste of water and dough that was boiled quickly and lightly (akin to “fresh” pasta today) and hard noodles, where the dough was extruded through a machine before being dried (a bit like the crunchy, shelf-stable pastas you can find at modern grocery stores). Soft noodles, like the “Macrows” featured in the Forme of Cury, called for cooks to roll out “a thynne foyle of dowh and kerve it on peces, and cast them on boillying water & see[th] it wele.” Quick-cooking and easy to make, soft noodles were popular in a lot of eighteenth-century dishes. The pasta Thicknesse was describing, however, would surely have been dried, as it had been transported to Britain from France. Early modern dried pasta was durable and was considered easy to transport, even under very difficult conditions. And it was massive: the earliest surviving example of an eighteenth-century pasta extruder made bigoli (a huge type of spaghetti) which was just over a foot long and 3 inches wide. Even one of these enormous, snake-like pieces of pasta could have constituted a meal. Hugh Plat (c.1552-1608), an English inventor and writer, created a different kind of pasta machine in the late sixteenth century, which produced oval-shaped, wafer-like pieces of pasta. 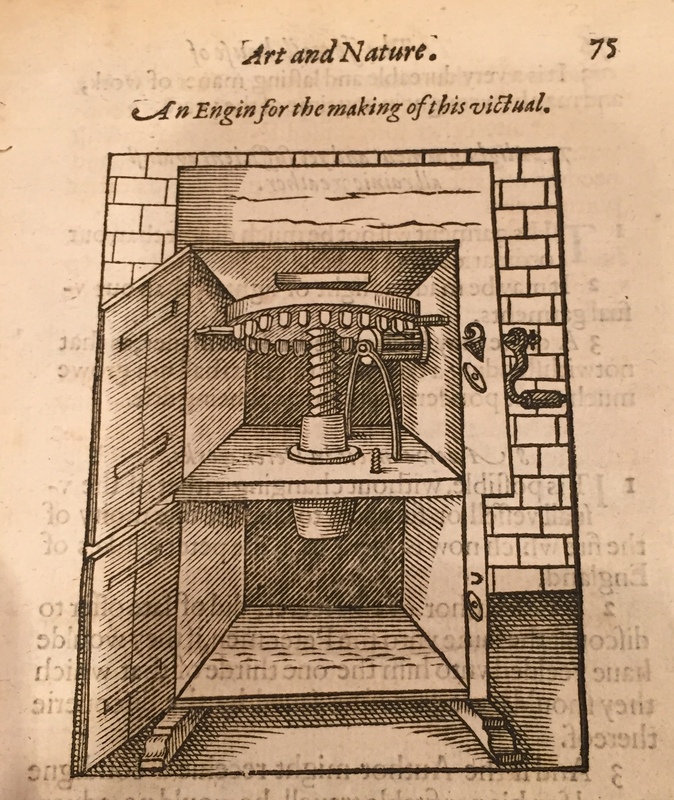 Plat included a diagram of this pasta machine in his Jewell House of Art and Nature (1594); while it’s notoriously difficult to get a sense of scale in early modern schemas such as these, comparing the size of the hand-crank on the right side of the machine with the pieces of pasta coming off of the wheel suggests that each wafer would have been three or four inches across – much larger than a modern orecchiette or conchiglie. 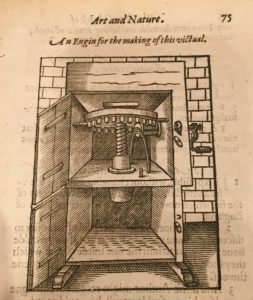 Pasta Machine in Hugh Plat, The Jewell House of Art and Nature: Conteining Divers Rare and Profitable Inventions… (London, 1594) STC19991, c.2, Folger Shakespeare Library, 75. Everything I learned about eighteenth-century dried pasta suggested that it would have taken ages to cook until tender. And although the resulting pasta might well have differed from the way that I expect modern pasta to look and taste, Thicknesse’s estimate of an hour and a half in cooking time perhaps wasn’t so far off after all, and the confusion was on my part rather than his. Historical food recipes are fun and engaging, offering us almost instantaneous senses of familiarity and closeness with the past: food is a great universal. But as we analyze old recipes and work to understand them, we have to fight our assumptions and presuppositions – perhaps especially about ingredients which are the most familiar to us – in order to make sure that we’re translating accurately. Hugh Plat, The Jewell House of Art and Nature: Conteining Divers Rare and Profitable Inventions… (London, 1594) STC19991, c.2, Folger Shakespeare Library. Philip Thicknesse Letters, c. 1770-c. 1785, MSS TH 1, Huntington Library. The Oxford Companion to Food, Alan Davison ed. (Oxford UK: Oxford University Press, 1999), 580-584. Sidney Lee, “Plat [Platt], Sir Hugh (bap. 1552, d. 1608), writer on agriculture and inventor,” Oxford Dictionary of National Biography. Accessed April 23, 2018. http://www.oxforddnb.com/view/10.1093/ref:odnb/9780198614128.001.0001/odnb-9780198614128-e-22357. Malcolm Thick, “Sir Hugh Plat’s Promotion of Pasta as a Victual for Seamen,” Petits Propos Culinaires Vol. 40 (1992).